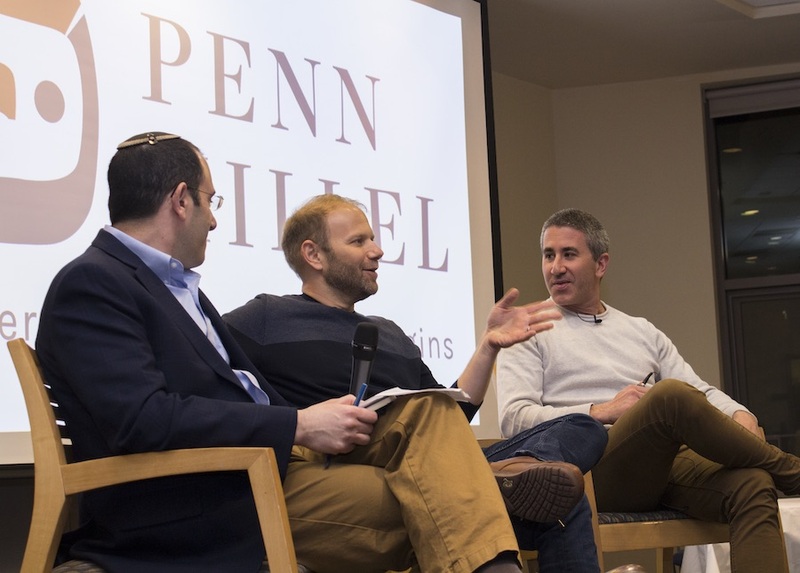 Rabbi Mike Uram, Steven Cook W’95, and Michael Solomonov discuss Israeli food and identity at Penn Hillel. Hordes of hungry Penn students swarmed Penn Hillel’s Steinhart Hall on November 5 for a lesson from perhaps the most famous duo in Philadelphia’s restaurant scene, Michael Solomonov and Steven Cook W’95. The pair operate CookNSolo, the restaurant group responsible for six restaurants that help shape Philly’s robust and eclectic gastronomical identity, including Abe Fisher, Dizengoff, Federal Donuts, Goldie, the Rooster, and, most notably, their flagship enterprise, Zahav. Getting a reservation at this crown jewel of cultural diffusion and tastefully addicting falafel is nearly impossible. Food & Wine magazine recently named Zahav one of the 40 most important restaurants of the past 40 years. Part of the Ilan Heimlich Memorial Speaker and Film Series at Penn Hillel and sponsored in part by Penn Hillel, Spoon University, and a variety of other student-run organizations, the discussion was guided by moderator Rabbi Mike Uram. Solomonov and Cook talked candidly about being Israeli American chefs in a world that often rejects earnest displays of Israeli pride, and how that identity shapes their business. 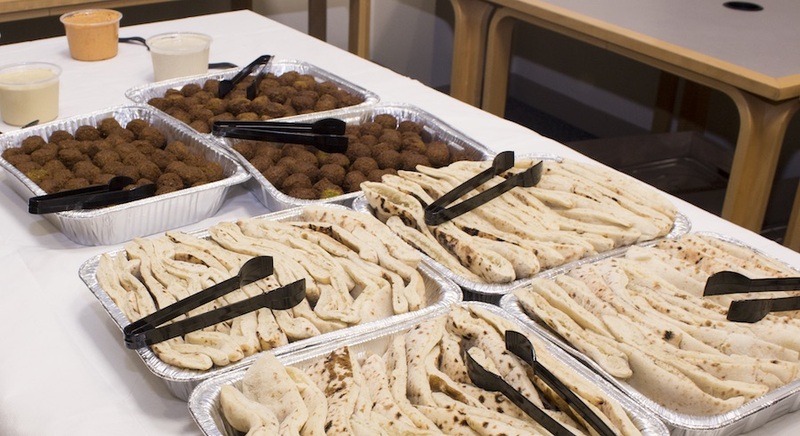 Goldie falafel was in high demand at the Nov. 5 event. Photo credit: Penn Hillel. Solomonov, born in Israel and raised in Pittsburgh, has always viewed his Israeli identity as central to his cooking. He fell into the hospitality industry in a roundabout way, taking his first job out of college at a bakery in Israel. Every day at work “felt like a town hall,” he reminisced. 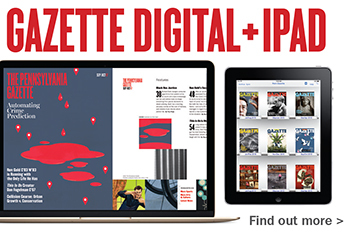 It was this desire for connection that brought him through culinary school and eventually led to a job as sous chef at a prominent Italian restaurant in Philadelphia. But a tragic event shifted his focus. In 2003, Solomonov’s brother, a sniper for the Israel Defense force, was killed in action by Lebanese militia on Yom Kippur eve, three days before his discharge. This event shook Solomonov and brought him much closer to Israel than ever before. “After that I didn’t want to cook Italian food,” he said. 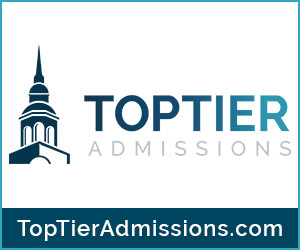 Cook had gone to Wharton, and like many of his peers, entered the stable world of investment banking after graduation. But the routine of endless number crunching and board meetings didn’t fulfill him. “I knew right away that I wasn’t going to like my cubicle,” said Cook. During his six-year stint on Wall Street, Cook took nighttime culinary classes at the famed International Culinary Center and threw elaborate dinner parties. Upon receiving his chef’s hat, Cook leapt right into the restaurant industry. Cook ran concentric circles around Solomonov in Philly’s restaurant scene. But when the pair finally met, it was kismet. Their Jewish upbringing and unabashed love for Israeli cuisine—its vibrant seasoning, emphasis on freshness, and inherent community—catalyzed their partnership. From there, Zahav was born, in 2008. Zahav is the equivalent of a 10-page love letter to Israel. The restaurant, lauded for its hummus and authentic Israeli entrees, is more than an impressive place to bring a date. It’s a subtle, but nonetheless potent, political statement. “We want to express the hundred different cultures that come together in one place and change the narrative of Israel through food,” remarked Solomonov when asked about the message behind Zahav. The restaurant, according to the pair, was the first upscale eatery in Philadelphia to serve Israeli cuisine and own it as such. 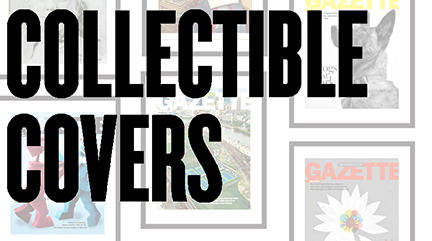 “We helped shift culinary culture. Serious cooking no longer means cooking French food. It means cooking what’s personal to you,” said Cook. And little is more personal to the pair than Israel. 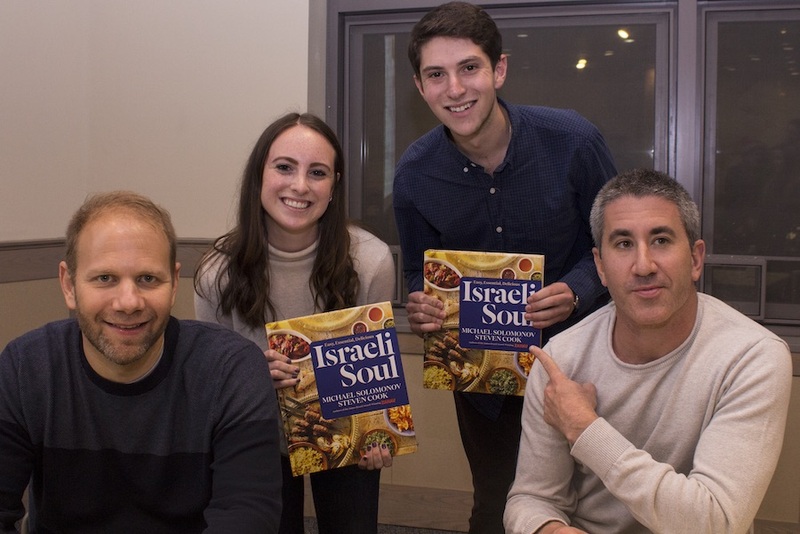 Steven Cook W’95 (left) and Michael Solomonov (right) show off their latest cookbook with students at Penn Hillel. Photo credit: Penn Hillel. This is evident in their defense of authentic Israeli cuisine. Despite its overlap with the cuisines of the entire Middle Eastern region, Israeli dishes are uniquely beautiful, they said. Israeli cooking is baked in a “method of commonality,” said Cook. “Israel is the product of hundreds of cultures on a diaspora back to the homeland, so its cuisine is more than Middle Eastern food.” This notion, that to cook Israeli means to cook for every denomination, is at the heart of every plate served at Zahav. After all, said Solomonov, “once you get a little bit of Israel in your blood, it’s hard to disassociate from it.” —Beatrice Forman, a freshman in the College.